Keywords: 3D human motion, gait on stairs, classification abnormal events, automated detection. It is estimated that between 25-35% of people 65 years or older fall each year. Although only a small percentage of those falls cause severe injury, a percentage that increases with age, falls among the elderly are a major health concern . Taking into account the amount of time people spend on stairs, this makes stairs the most dangerous component of any home . Therefore, understanding the reasons why people fall on the stairs, may help to prevent such accidents. Also, it may help to increase the possibility for elder people to age at their homes, and to develop intelligent assistants for their comfort. Therefore, the objective of this project is to develop a system that can monitor stairs and automatically detect any abnormal event that may occur. Previous work was develop by Jasper Snoek  at IATSL. However, it is the motivation of this project to explore the use of 3D information, retrieved by a Kinect, to analyze gaits on stairs and to extract useful information capable of detecting abnormal events. 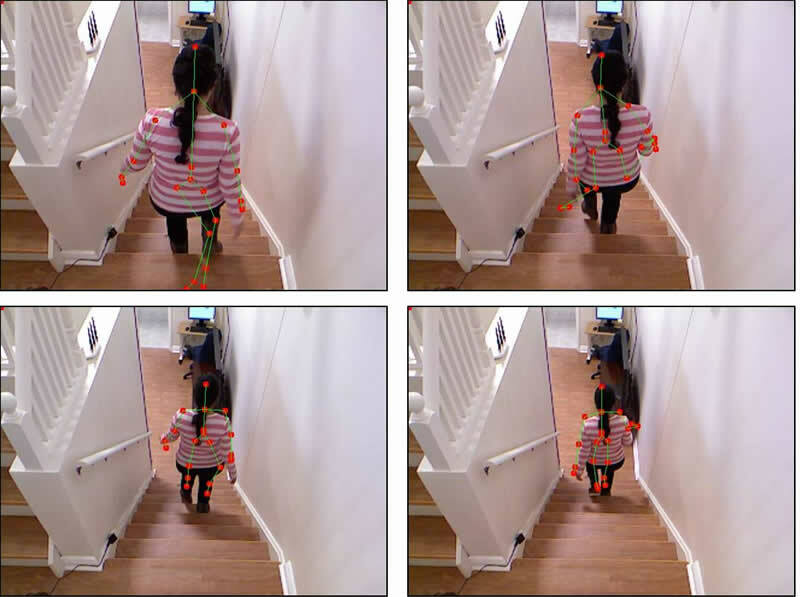 The handrail is located using computer vision techniques (Figure 1), later using the hand tracking provided by the Kinect sensor, it is determined if it is being used (Figure 2). Figure 1: Handrail localization (click to enlarge Fig. 1). Figure 2: Handrail use detection (click to enlarge Fig. 2). Using a Kinect, normal (Figure 3)and abnormal (Figure 4)gaits on stairs are recorded in a home laboratory environment, where 20 different joints are tracked on each sequence. Figure 3: Normal gait on stairs (click to enlarge Fig. 3). Figure 4: Abnormal gait on stairs (click to enlarge Fig. 4). Future work will focus on gait classification, with the position signal of the lower-limb analyzed using a Fourier transform. Later, using machine learning techniques, gaits will be classified as normal or abnormal. Stone, E.E. ; Skubic, M.; , "Passive in-home measurement of stride-to-stride gait variability comparing vision and Kinect sensing," Engineering in Medicine and Biology Society,EMBC, 2011 Annual International Conference of the IEEE , vol., no., pp.6491-6494, Aug. 30 2011-Sept. 3 2011 doi: 10.1109/IEMBS.2011.6091602. Michael S Roys, Serious stair injuries can be prevented by improved stair design, Applied Ergonomics, Volume 32, Issue 2, April 2001, Pages 135-139, ISSN 0003-6870, 10.1016/S0003-6870(00)00049-1. Jasper Snoek, Jesse Hoey, Liam Stewart, Richard S. Zemel, and Alex Mihailidis. Automated detection of unusual events on stairs. Image and Vision Computing, 27(1-2):153 – 166, 2009.